The Four: Battle for Stardom will continue. Today, FOX announced they’ve renewed the TV show for a second season. Hosted by Fergie, the singing competition series pits four singers against each other in hopes of winning a promotional deal with iHeartRadio. Judges include Sean Combs, DJ Khaled, and Meghan Trainor. While The Four has yet to match American Idol‘s numbers, the FOX show is still doing okay in the ratings. So far, season one is averaging a 1.17 rating in the 18-49 demo and 3.589 million viewers. The season finale of The Four: Battle for Stardom premieres on FOX tonight, February 8th, at 8 p.m. ET/PT. FOX has renewed its new music competition series, THE FOUR: BATTLE FOR STARDOM, for a second season, to premiere this summer, it was announced today by Rob Wade, President, Alternative Series & Specials, Fox Broadcasting Company. This season on THE FOUR: BATTLE FOR STARDOM, four fierce recording artists, spanning all music genres, have fought to defend their coveted seats in front of a panel of industry experts: Grammy(R) Award-winning musician, record producer and songwriter Sean “Diddy” Combs, record-producing hitmaker DJ Khaled and Grammy-winning recording artist and songwriter Meghan Trainor. Eight-time Grammy(R) Award-winning and multi-Platinum solo artist Fergie has served as host, guiding the contestants, while they have battled it out against new recording artists determined to take their spots in the competition. At stake is the ultimate prize: The panel of industry experts become key players on the winner’s team. This season’s elite group of star-makers will help shepherd the winner’s career to help make him or her a breakout star. Additionally, as part of this season’s grand prize, the winner will be named an iHeartRadio “On The Verge” artist. 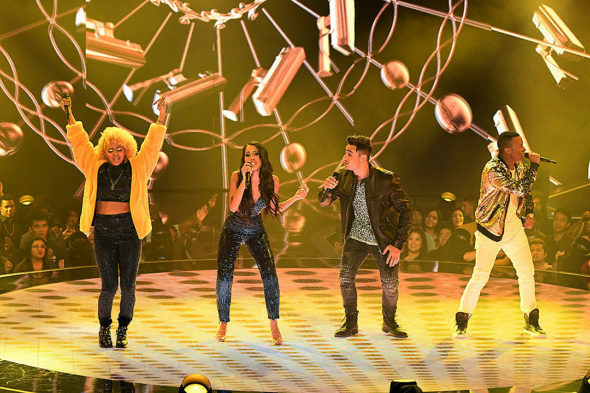 In the epic season finale of THE FOUR: BATTLE FOR STARDOM airing tonight (8:00-10:00 PM ET/PT) on FOX, the FOUR – Candice Boyd, Vincint Cannady, Evvie McKinney and Zhavia – will battle each other to be named winner. What do you think? Are you watching The Four: Battle for Stardom? Will you watch season two? More about: FOX TV shows: canceled or renewed?, The Four: Battle for Stardom, The Four: Battle for Stardom: canceled or renewed? No, it’s the same as all the rest. It should have been cancelled!